When The Guardian profiled Strawberry Switchblade the polka-dotted pop-punk outfit formed by Rose McDowall and Jill Bryson who lit up the charts in the early eighties Rose McDowall joked that she'd like to be known as the female Leonard Cohen. But on the Our Twisted Love EP her latest release as part of Night School Records reissue campaign it's Nico that springs to mind. The title track recorded a few years after her cover version of Nico's 'Afraid' for a limited John Contreras CD, continues the harmonium drenched sound, as a backdrop to her bittersweet, lilting tones on a track shrouded in guitar shimmer and sorrowful violin plucks and weeping cello score telling on the breakdown of a relationship. As it gently unfurls over rudimentary beats it swells into a Velvet Underground type psychedelic jam before settling back into the baroque classicalism more reminiscent of Sorrow, the now defunct project she shared with her ex-husband Robert Lee. 'The Calling', meanwhile, bathes in melancholy and melody, with Rose's pure fragile tones both spoken and sung in a beautiful Glaswegian brogue. Placing honeyed melodies over 12-string acoustic guitar augmented by a small string ensemble, as it wrestles with the onslaught of fear, tears and darkness. Heartache has never sounded so sweet. Listening to this now 'The Calling' almost offers a bridge between the eighties electro polished melancholy of Strawberry Switchblade and the timeless ether-pop of Sorrow. After tracks ruminating on love, loss and fragile mental states, the final piece continues to push the emotions with a cover version of the classic Bacharach and David penned 'Make It Easy On Yourself', made famous by The Walker Brothers with their Spector-esque arrangement in 1965. Of course, as Spell, Rose and controversial noise artist Boyd Rice sprinkled their magic on a number of sixties classics focussing on the twin themes of love and death. This time, however, on this solo outing Rose McDowall opts to strip back the track to a piano arrangement swathed in violin and cello. McDowall emotes with a soothing frailty, the whole thing oozing heartbreak as she sets her lover free to love another. 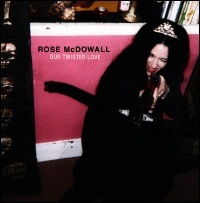 Rose has added sweetened vocals to recordings by Felt, Psychic TV, Death In June, Current 93, The Pastels, Naevus, Alex Fergusson and many others but I don't think I've heard anything as stark and as brittle as this from Rose McDowall.